Harnessing big-bore power in a custom-grade, billet-crafted package ready for duty! The BILLet-AR ran flawlessly from a number of realistic shooting positions, making it a great choice for a patrol rifle. 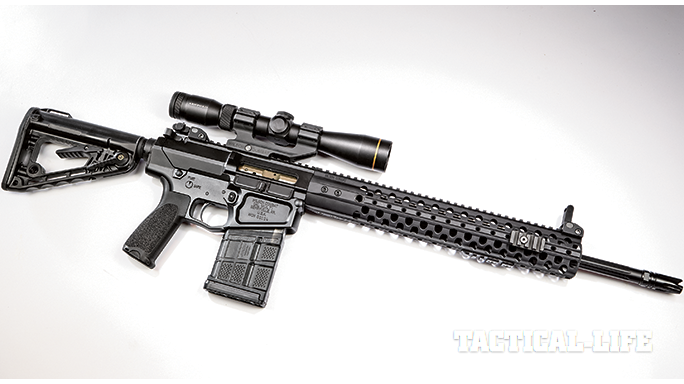 Wilson Combat’s first 7.62mm NATO rifle, the custom-grade BILLet-AR is a tank-tough design that expertly combines power and sub-MOA precision. Shown with a 4-12x40mm Leupold VX-R scope and a SureFire Scout light. 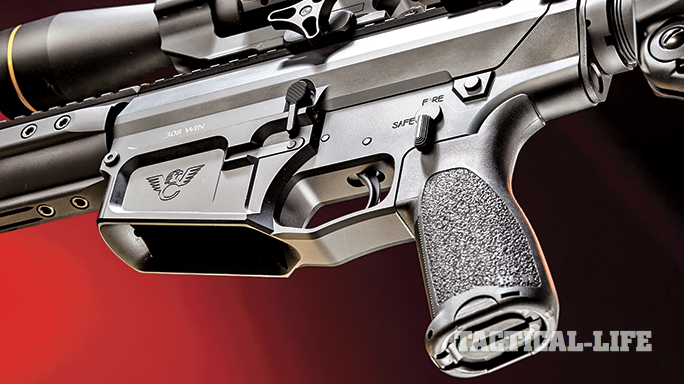 Built using a single billet of 7075-T6 alumium, the CNC-machined receivers are well designed, lightweight and strong. Note the smooth lines, the contouring around the magazine well and the enlarged, integral triggerguard. The magazine well is flared for fast reloads, and the BCM Gunfighter grip offers extra control as well as a storage compartment. 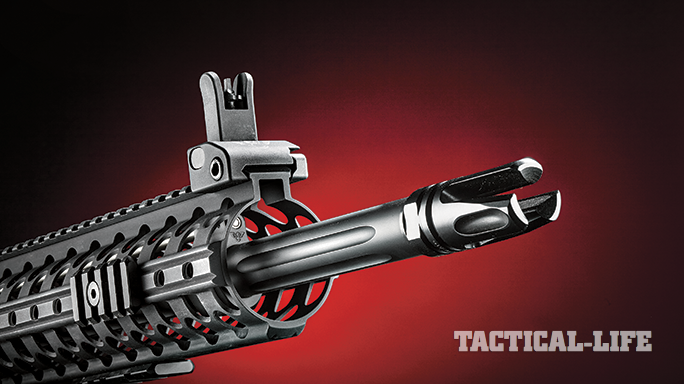 The author’s test BILLet-AR rifle featured a fluted, 18-inch, match-grade barrel with a 1-in-10-inch twist rate and one of Wilson’s Accu-Tac flash suppressors. The Rogers/Wilson Super-Stoc can be adjusted to six different length-of-pull positions and has several sling mounting points. 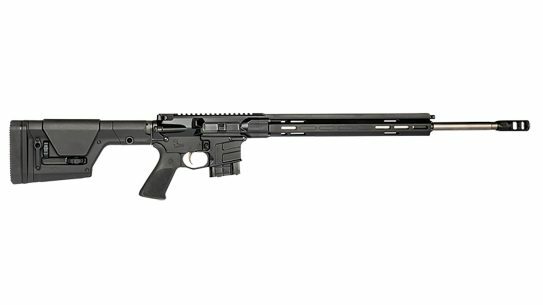 Wilson Combat’s first 7.62mm NATO rifle, the custom-grade BILLet-AR is a tank-tough design that expertly combines power and sub-MOA precision. 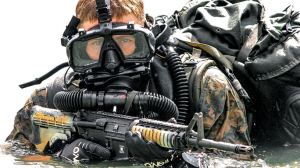 The need for rifles with greater range and more power than the 5.56mm, both within and outside the tactical communities, has always existed. 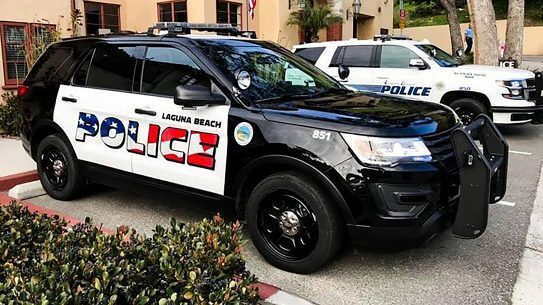 While those in politics or the media have a perception that LEOs do not need that much power, they are ignoring reality, which can be risky and lethal. 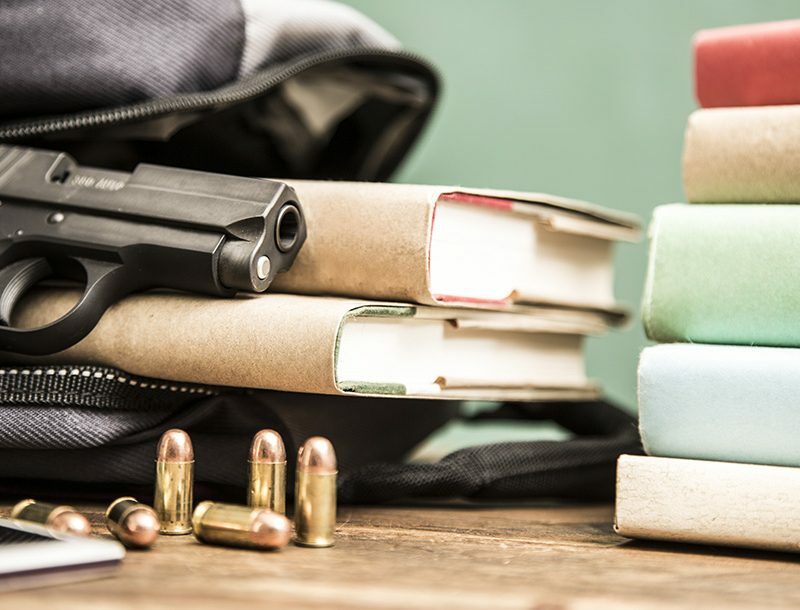 What works best should be determined by your area of operation, your typical engagement distances and the types of threats you’re likely to encounter. Each LE agency is different. Rural agencies encounter well-armed threats with driveways longer than some city blocks. What works across the room in the big city may not get the job done from across the field in rural America. Take a drive across this great country and you’ll notice vast open areas with minimal cover and concealment options. If I had to pick a patrol rifle for these remote areas, it wouldn’t be a 5.56mm with a red-dot sight—it would be bigger and have an optic. For this role there are tons of choices now, but not many are as viable as the venerable .308 Winchester/7.62mm NATO. Seeing the AR platform’s evolution over the last 20 years has been interesting. 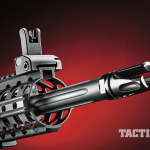 It has truly come a long way, especially in its most prolific chambering, the 5.56mm. 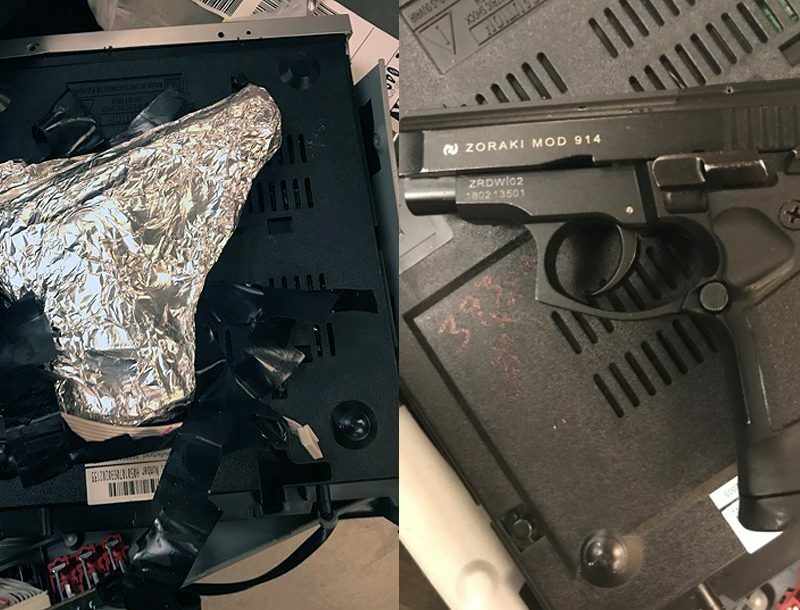 Once almost obscure, the AR-15’s only rivals these days when it comes to variety may be cell phones. 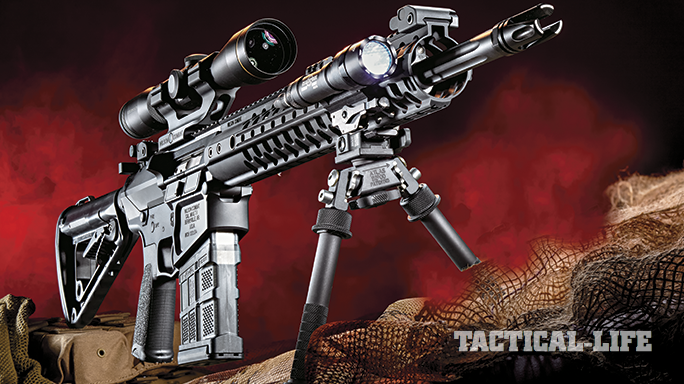 Everything from pistols to precision rifles exists in every conceivable length, configuration and color. Most are more reliable and accurate than ever, with some astoundingly so. Prices range from $500 to $5,000, meeting most any need. Until recently, however, that was not the case with .308/7.62mm ARs. The choices were slim, reliability potentially spotty and accuracy that could be marginal. 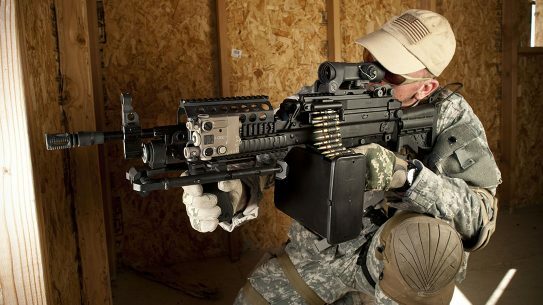 But manufacturers have come a long way, and these ARs are now better built, more accurate and infinitely more reliable. 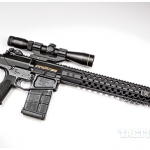 Entry-level rifles cost around $1,500 while the prices for custom rifles reach into the stratosphere. 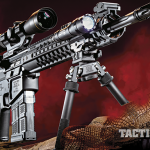 What today’s operators needed was something in the middle, and that sector is growing quickly, with solid rifles in the $2,500 to $3,000 range becoming increasingly popular. 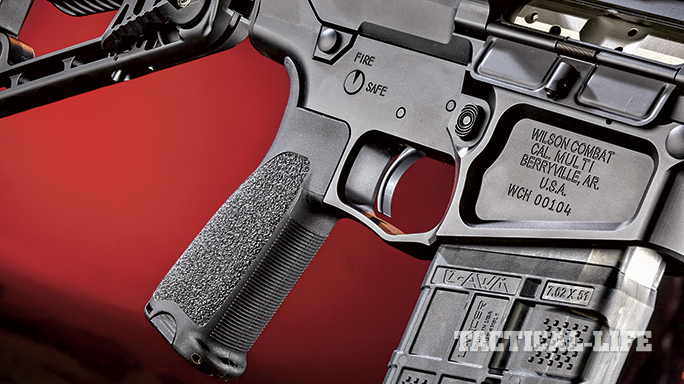 Wilson Combat’s new, custom-grade 7.62mm ARs are at the top of this category. Bill Wilson, the founder of Wilson Combat, is one of my friends. 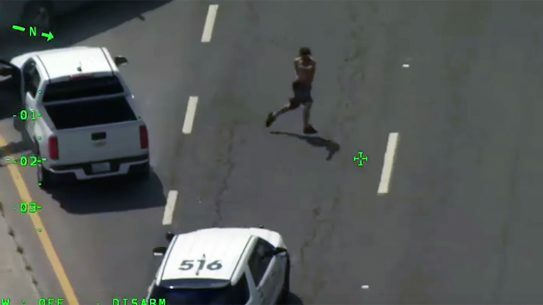 I’ve hunted hogs with him, trained with him and shot with him several times. I’ve also tested most of Wilson Combat’s rifles, and they all have a few recurring themes. Bill likes things simple, clean and reliable—exactly what most officers need. Bill may yield to the market on occasion, but he makes no compromises when he does. 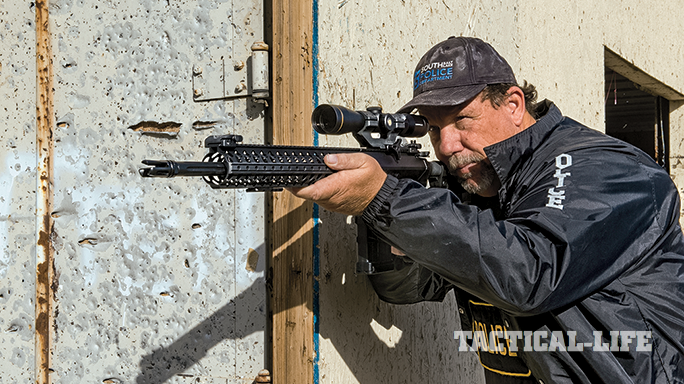 His rifles, like all Wilson Combat products, are reflections of what he wants and deems critical. Ignoring trends, he builds what he believes in and shares it with us, quite successfully in fact. 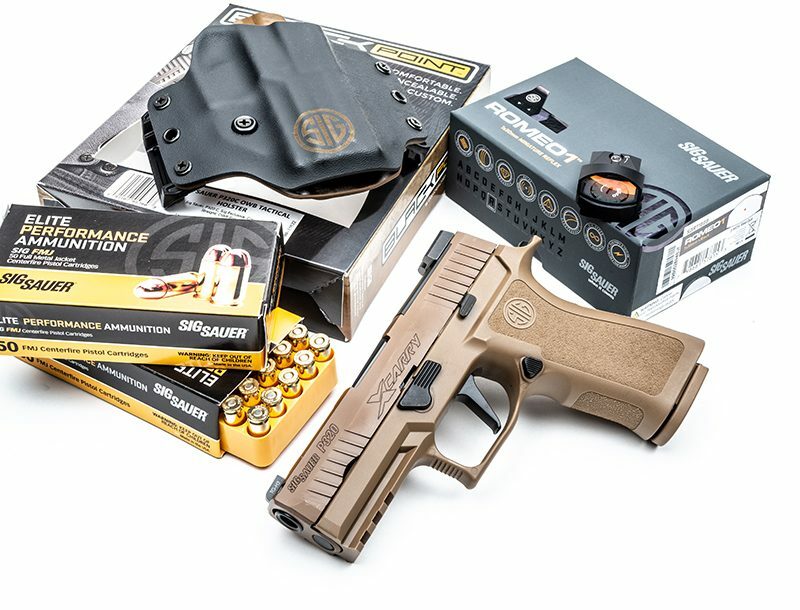 Wilson Combat’s products are highly sought after, and they have been for years. 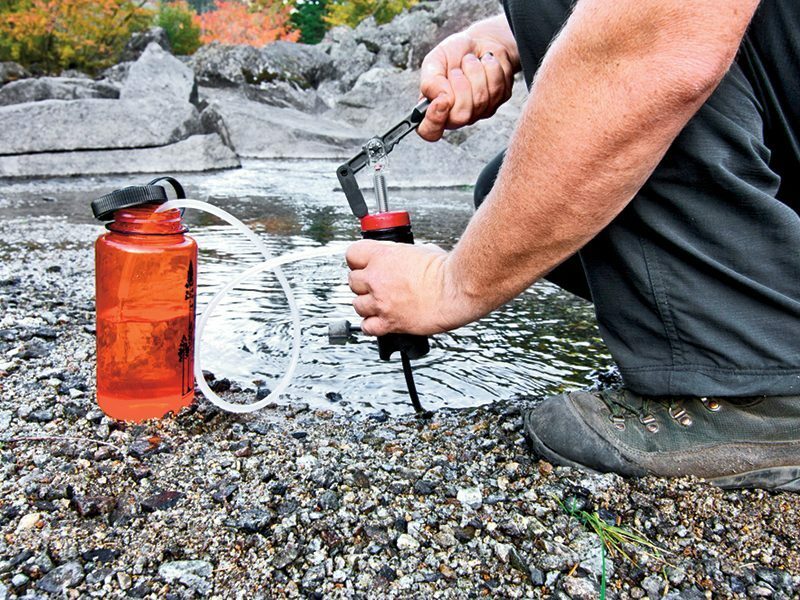 Much of that demand comes from the company’s no-compromise attitude and real-world testing. Every Wilson Combat design is tested on his range, often for months prior to any commercial release. Torture-tested for accuracy, portability, comfort and reliability, his rifles are among the most dependable I’ve ever used. Wilson’s rifles are also taken on hog hunts and through state-of-the-art training courses, so it’s pretty safe to say that every rifle Wilson Combat introduces was used in the field prior to ever making it to the market. 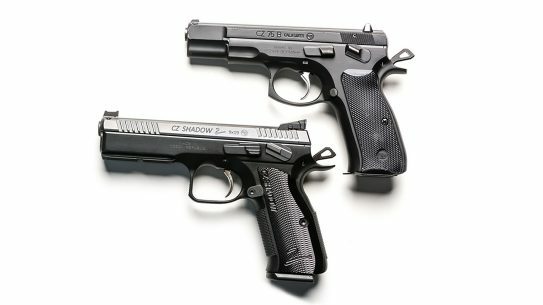 And with this one, I think Wilson Combat has brought a real winner to the market. Specifically, I am referring to the 18-inch-barreled Wilson Combat BILLet-AR 7.62mm rifle I recently tested. The rifle starts with Wilson Combat’s BILLet-AR upper and lower receivers, which are machined from a solid billet of 7075-T6 aluminum. Coated in a nice, matte black Armor-Tuff finish, they both have smooth angles and lines. Sharp edges are removed wherever possible and weight is kept to a minimum. The upper receiver has no forward assist and mates perfectly to the lower receiver. Several barrel options are available, and my test rifle came with an 18-inch, fluted, 1-in-10-inch-twist, stainless steel barrel with a match chamber. 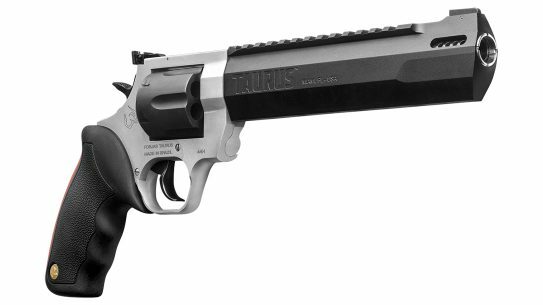 The barrel is also capped with an Accu-Tac flash suppressor. 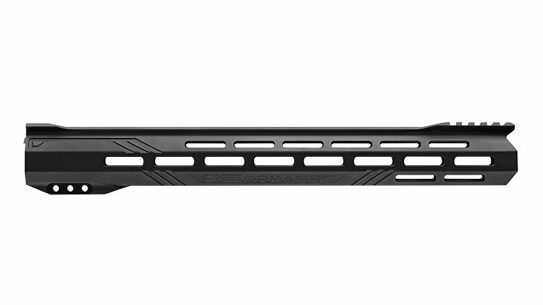 Wilson’s TRIM handguard surrounds the barrel, rifle-length gas tube and low-profile gas block. The premium bolt and bolt carrier group are NP3 plated for durability and ease of cleaning. 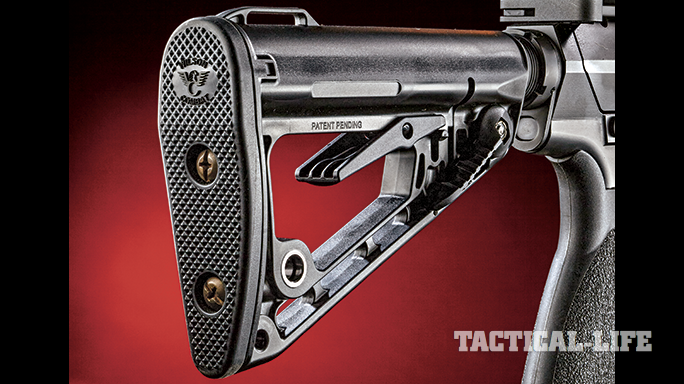 Wilson’s Tactical Trigger Unit (TTU) is housed in a clean and smooth lower receiver. Everything is nicely rounded, especially around the triggerguard. 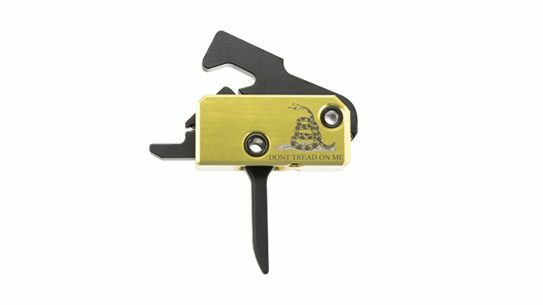 Single-stage triggers come standard, but my test rifle came with a two-stage design. Breaking at 4 pounds with a predictable first stage, it should meet most policy requirements while providing for superb accuracy. 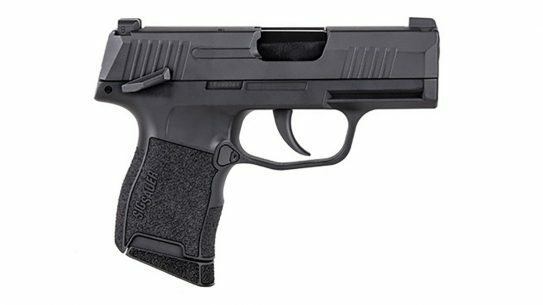 Wilson also offers a TTU with a 5- to 5.75-pound pull for more stringent duty applications. The lower also has an enlarged triggerguard that provides enough room for gloved hands. 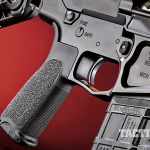 Bravo Company’s BCM Gunfighter grip is installed for greater comfort and control. The six-position buffer tube sports a Wilson/Rogers Super-Stoc. 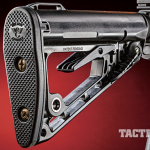 Wilson Combat also supplied my test rifle with a set of flip-up sights for the long, continuous top rail. For testing I used a Leupold 4-12x40mm VX-R scope with the company’s FireDot reticle. The center section of the reticle includes a small circle with a dot in the middle. Pressing the illumination button on the left side of the scope lights up the dot. If you keep pressing it, you’ll cycles though several intensity levels. Two lines sit at 2.1 and 4.8 MOA below the center for holds at longer ranges. The scope also has 0.25-MOA zeroing knobs that are covered for protection. I installed the scope in a Wilson Combat Accurizer scope mount, providing the proper eye relief with a solid return to zero. I expected excellent accuracy, and I was certainly not disappointed. For a real comparison, I tested the BILLet-AR 7.62mm alongside two custom precision bolt-action rifles, and the Wilson kept up with both of them. 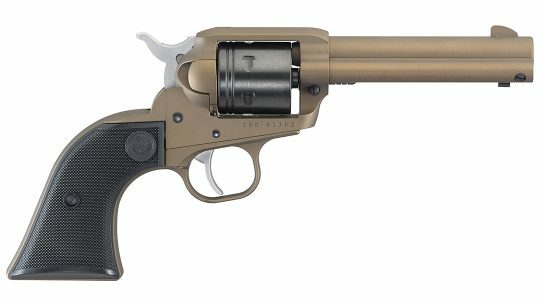 Wilson’s rifles have always been accurate, and this one was as accurate as factory ammunition can shoot. Admittedly, this is becoming the norm with ARs in this price range, especially those designed as precision rifles. Either way, this test alone dispels any remaining myths as to the inaccuracy of the semi-automatic platform. The rifle’s best group, produced with Federal’s 168-grain Gold Medal Match ammo, measured exactly 0.5 inches at 100 yards. Hornady’s 155-grain TAP A-MAX was also superbly accurate, along with most of the match ammunition. Even the Barnes 168-grain TTSX shot right at an inch. Next I tested the rifle for groups at 300 yards, and then shot steel targets between 100 to 400 yards. Holding under 1 MOA, the rifle produced a group measuring a tad over an inch at 300 yards on a crisp, wind-free morning. 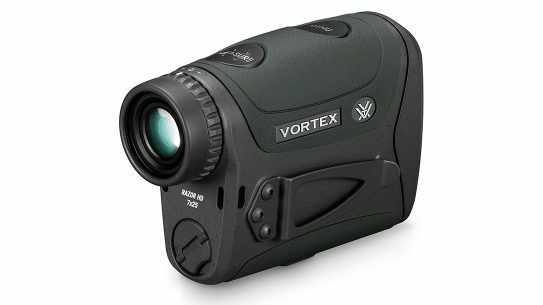 The Leupold VX-R scope could serve in a patrol environment just fine. The center aiming section allows for easy quartering of the target and excellent precision. Turn on the dot and it is easy to get center hits at closer ranges. 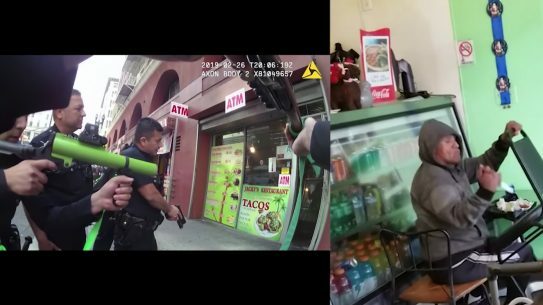 Even at 25 yards, 4X magnification provided a decent field of view, and 12X is more than enough power for most police environments. Testing the holds, they could be used pretty easily in a police environment. Running my ballistic software and a 100-yard zero puts the first line (2.1 MOA) right at my 200-yard elevation. The second line (4.8 MOA) was very close to my 300-yard holdover, which I confirmed on steel. Using a 200-yard zero gets you closer to 275 and 350 yards, respectively. 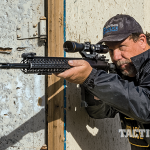 The second-focal-plane reticle just means you need to really work this out with your ammunition at each power to be certain, but it is fast and easy to use. Leupold also includes a chart with the scope that outlines the zeroing procedures for various loads. The rifle ran flawlessly with Lancer’s L7AWM magazines, which are quickly becoming some of my favorites, especially for prone shooting with a carbine, because they’re designed to sit flat on the ground. So far these magazines have worked well in every 7.62mm AR I’ve tested, and the Wilson was no exception. 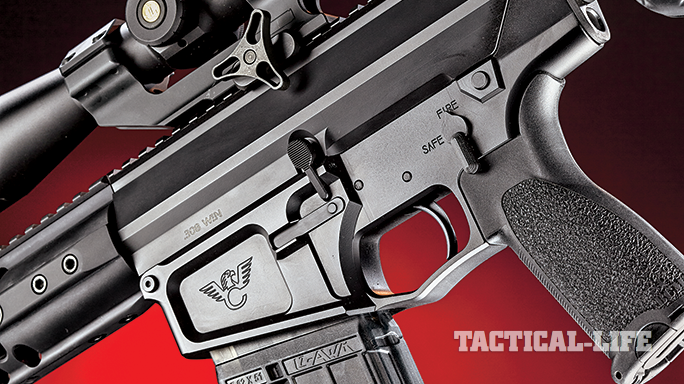 Wilson Combat fans are going to love this rifle. 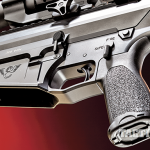 Sure, they’re already a pretty loyal group of people, but it is an excellent rifle for anyone looking for a custom-grade design with proven operation. 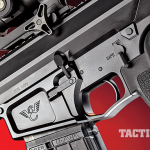 It is just like every other Wilson Combat rifle I’ve tested—it’s accurate, reliable, well balanced and a true joy to shoot. Weighing in at less than 10 pounds loaded, it is very comfortable to carry. Keep your accessories to a minimum and it will stay that way. Add a light, a sling and a spare magazine and this rifle could go to work tomorrow. It really is exactly what Bill has been telling me he wanted for years. It’s simple, clean and, above all, accurate and dependable, making it just about perfect for any use, including as a patrol rifle.